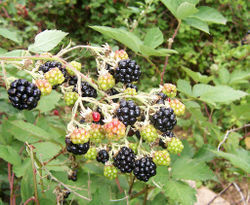 The blackberry is also the fruit of the blackberry plant. In proper botanical language, it is not a berry at all, but instead an aggregate fruit of numerous drupelets. Blackberry blossoms are good nectar producers, and large areas of wild blackberries will yield a medium to dark, fruity honey.